“This program saved my life,” he says as he enters the room. Kris, 37, is in the Spokane Regional Health District methadone clinic where he has come for treatment of heroin addiction since 2008. The intense, dark-haired man speaks openly, earnestly, as if he has nothing left to lose. Kris says his journey into addiction began, “Quite simply, by a doctor.” Struggling with pain from a minor car accident in 1999, he was prescribed increasingly stronger doses of hydrocodone and OxyContin over a nine-year period. The FBI eventually raided the unethical physician and closed his practice, leaving patients like Kris stranded and facing withdrawal when their prescriptions ran out. Kris couldn’t afford the price of black market pills so, in desperation, turned to the much cheaper street heroin. Years later, in the hospital, Kris was offered a chance for rehab and took it. “I’m a huge proponent of methadone,” he says. “Fear is a strong motivator. Once you’re clean, the fear is you’ll go back, so you’re very compliant. With slight variations, Kris’s story is typical of the 700 patients currently enrolled in the Spokane Regional Health District (SRHD) Opioid Treatment Program, says program medical director Matt Layton, a clinical associate professor in the Elson S. Floyd College of Medicine at Washington State University Spokane where he teaches psychiatry and behavioral health. Layton is among those at WSU doing battle on the front lines of the nation’s sweeping heroin epidemic. 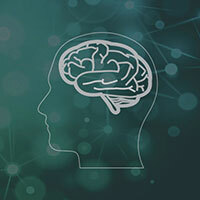 Together with researchers from the University of Washington and the Washington State Department of Health, he helps investigate the behavioral and biochemical basis of opioid addiction, while working to dispel confusion and stigma surrounding its treatment. Death rates tied to heroin use in the United States have nearly tripled since 2010. In Seattle alone, there were 156 fatal overdoses reported in 2014, up 58 percent from the year before. At the same time, deaths from prescription opioid painkillers have declined. The opioids were in truth highly addictive and, in conjunction with similar drugs, led to thousands of cases of dependence, death, and subsequent heroin use. Once largely confined to ‘skid row’ areas, heroin has now moved into affluent neighborhoods where teens with money to spare are a target for drug dealers. In 2008, federal and state officials began placing restrictions on the use and formulation of opioid drugs. Layton says Washington state now requires a second opinion for approval of stronger prescriptions. The formulation of OxyContin was also changed to make it “burn like crazy if you try to snort it and gum up if you try to dissolve it for injection,” he says. The drugs took a corresponding leap in price. “The result was a bunch of people addicted to pain pills that suddenly got very expensive and difficult to obtain,” says Layton. “So, they went to heroin, the opioid that was cheap and plentiful. But, it’s junk and it makes people very sick.” Injecting heroin can cause health problems like HIV/AIDS, heart disease, hepatitis, abscesses, and sepsis. “About half of our clients have HIV or hepatitis C,” he says. With the passage of the Affordable Care Act and expansion of Medicaid in 2010, people with drug addiction, including the homeless and mentally ill, became eligible for health coverage. Today, instead of jail time, many repeat drug offenders are offered counseling and Medication Assisted Treatment (MAT) in methadone and Suboxone programs. In the dispensary at the SRHD methadone clinic, Lakeisha, 27, smiles and nods at other patients as they queue up for their daily doses. Men and women, young and old, mill about talking quietly. Some are in line for urinalyses, or blood and breathalyzer tests to check for illicit drugs. Signs of alcohol or benzodiazepines—deadly if mixed with methadone—can cost the client that day’s dose. Methadone is a drug that binds and activates the same brain receptors heroin uses but does not produce the euphoric high. The program is based on a harm reduction model that helps patients stabilize and rebuild a normal life while reducing cravings for heroin. As with other therapeutic use of opioids, clients develop physical dependence on methadone, but are considered to be in recovery. Since the 1960s, hundreds of studies have documented the program’s success in lowering the incidence of crime, disease, death, and ongoing drug abuse. At SRHD, each dose of methadone lasts 24 to 36 hours, so most clients are experiencing symptoms of withdrawal by the time they are back in line each morning: anxiety, nausea, body aches, sweating. Missing a dose is not pleasant. Behind a locked door, employees prepare the methadone in a room that is sweet with a scent like cherry cough syrup. Outside, clients enter private booths where they present photo IDs through a window. 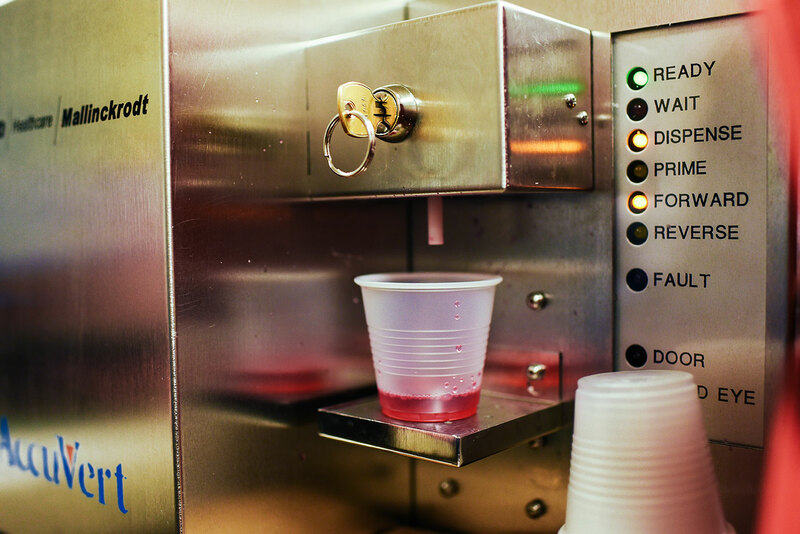 Once approved, a dispenser fills a small plastic cup with their individualized dose of pink methadone. Lakeisha has just taken her dose. Her hair is up and she’s wearing an apricot-colored top that compliments her skin and also reveals her seven-month pregnancy. This will be her fifth child and she’s been on methadone for seven years. Layton says pregnant women are given top priority into the program. Under the 2003 Keeping Children and Families Safe Act, all states are required to identify potentially drug dependent babies, regardless if the mother’s drug use is illicit or prescribed, he says. The act provides treatment for infants experiencing withdrawal symptoms and also alerts child protective services to follow up on the infant’s safety upon returning home, helping to break the cycle of addiction. Soft-spoken and articulate, Lakeisha says she began using opiates when prescribed hydrocodone for sciatica and a broken tail bone during her second pregnancy. “I knew enough not to take them everyday—I wanted to avoid physical addiction,” she says. But one day she discovered her doctor had stopped her prescription without telling her. She missed the drug’s euphoria, so went to another doctor for a prescription of Dilaudid and traded it with a friend for OxyContin. Soon she was taking it daily. That something was more OxyContin but this time Lakeisha smoked it to get it into her system faster. She vowed never to go through withdrawal again and would do anything to prevent it. She kept smoking the oxy. Lakeisha had heard so many bad stories about methadone that she resisted until becoming pregnant with her third child. She finally took the step to enter a treatment program for the child’s protection. She has been clean ever since. Heroin, arguably the world’s most addictive drug, originates in the milky sap of an opium poppy. The sap contains morphine which is extracted and processed to produce heroin. Once the drug is snorted, smoked, or injected into the body, it is metabolized back into morphine plus a kicker, a chemical six times stronger than morphine called 6-MAM. 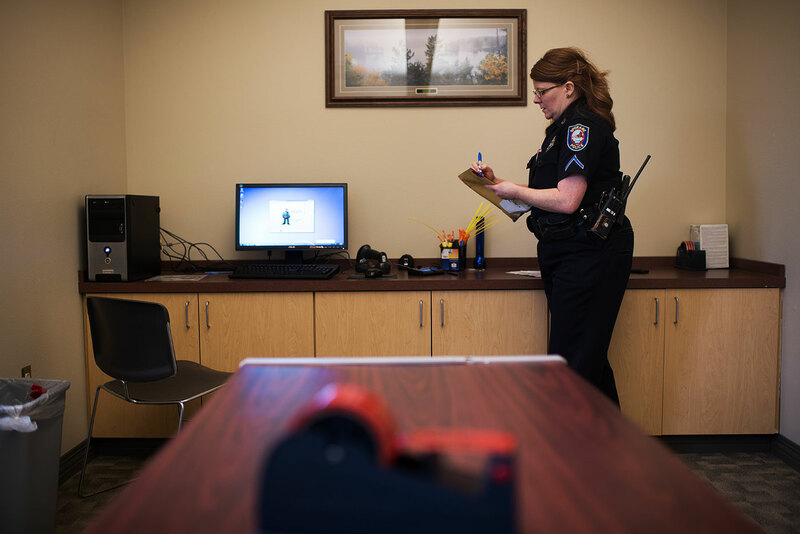 At the Spokane Police Department Evidence Facility, Officer Teresa Fuller unlocks a cabinet and retrieves confiscated samples of black tar heroin—a cheap and impure form smuggled from Mexico and commonly trafficked throughout the western United States. Wearing orange gloves, she cuts the “EVIDENCE” tape on several manila envelopes and removes the heroin. One dark brown sample comes prepared in an insulin syringe; another is covered in plastic wrap. A large flat piece feels squishy like a sheet of taffy; others are hard or powdered. Black tar reportedly smells like vinegar. In Spokane, a typical buy is said to run about $70 for a gram, enough to keep a person “well”—free of withdrawal symptoms—for one day. A bargain, compared to the cost of multiple pain pills. Drugs like heroin and OxyContin hijack the brain’s natural opioid system which controls emotional and behavioral responses to stress and pain. In a healthy system, “good” and “bad” opioids counter each other to maintain emotional balance. The “good” opioids—endorphins—relieve pain and create euphoria while “bad” opioids—dynorphins—cause anxiety and depression. Heroin produces its high by overriding endorphins and binding directly to their receptor sites. As the effects wear off, dynorphins kick in and cause some of the misery of withdrawal. More heroin eases that distress and the vicious cycle continues. It also results in unhealthy brain changes. Caleb Banta-Green, senior research scientist at the University of Washington Alcohol & Drug Abuse Institute and affiliate associate professor in the UW School of Public Health, collaborates with Layton on the statewide opioid task force. Banta-Green says long-term use of drugs like heroin damages the production of natural opioids in the brain. Layton says there is no actual cure for heroin addiction and agrees for most people it is a chronic, recurring condition that requires extended treatment. He cites research showing that short-term Medication Assisted Treatments result in a 90 percent relapse rate within 9 months, often involving overdose and death. Counseling or behavior modification alone show similar results. Chatting in the SRHD lobby, Mike, 61, reveals he’s been on methadone for about a decade after 19 years of being in and out of prison on drug charges. It’s a far cry from the plans he had as an eighth-grader attending Catholic school with a tentative scholarship to Gonzaga Preparatory School. Those plans were derailed when an altercation landed him back in public school where he had no friends. The only boy he knew was a neighbor who introduced Mike to drugs and eventually to heroin. “It was a stupid urge and I did it and pretty soon I was addicted,” he says. Yet, the idea of being addicted to a second drug discouraged Mike from enrolling in the methadone program for years. Today, thanks to SRHD, the once up-and-coming sprint car driver says he’s got his life back together. “I have a new Harley. I’m partnering with a buddy and have my street rods and show cars back. Richard, 62, agrees. 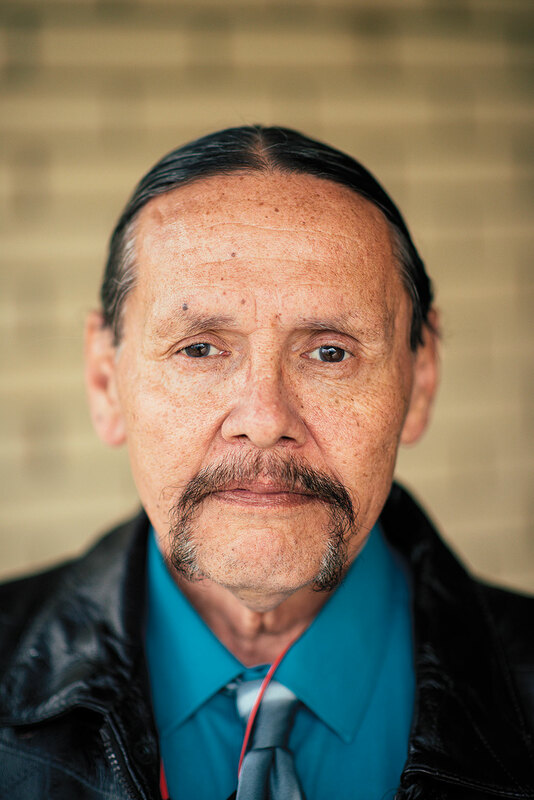 Native American and Vietnam era army veteran, Richard is a computer hardware technician and works at the VetsGarage in Spokane, a program that offers skill training and support services for veterans. He entered the world of drugs at age 13 as a result of constant battle with “a really nasty stepfather who killed my dog,” he says. Like Mike, Richard was fearful of methadone and addiction. But after years of prison and nearly dying of an overdose in 2011, he agreed to try. Controversial and confusing, Medication Assisted Treatment programs are often dismissed as merely swapping one addiction for another. It’s a stigma that Layton and Banta-Green challenge constantly. According to the National Institute on Drug Abuse, physical dependence can occur with the use of any substance, legal or illegal, and it’s not the same as addiction. Whether a person is using opioids to treat cancer pain or shooting heroin to get high, they all develop the same symptoms: tolerance, needing more to get the same effect, and withdrawal once the drug is removed. True addiction includes psychological and social aspects in addition to the physical symptoms. Examples are compulsive, uncontrollable drug seeking, anxiety about withdrawal, and loss of the ability to maintain healthy relationships. Yet the stigma lingers. Family and friends often continue to treat methadone or Suboxone patients as addicts. Addicts themselves resist getting treatment, or once on MAT, try to get off as quickly as possible. The misconception can kill if it prevents people from getting appropriate help. It is possible, however, for some well-stabilized patients to be safely weaned off MAT. 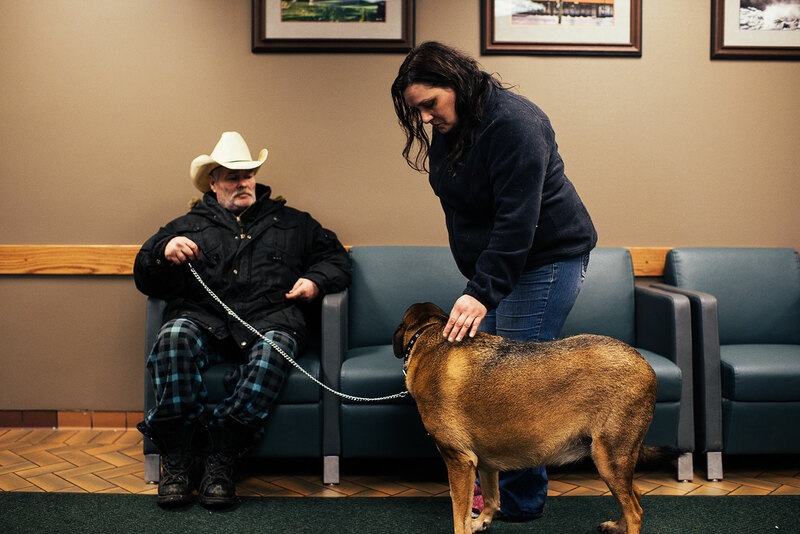 At the SRHD clinic, approximately 25 percent of Layton’s clients are tapering their doses of methadone in hopes of eventually stopping treatment. Even with treatment there can be relapse. Drug-related brain changes make people sensitive to environmental cues associated with previous use months or years after getting clean. Returning to the sights, smells, and sounds of old neighborhoods can reignite an intense craving for heroin. Poverty, prison records, unemployment, lack of education, and concurrent drug use can also derail efforts, as can untreated mental health issues like depression and PTSD. Most addicts also have genetic risk factors and family histories of addiction. Despite the alarming statistics, Layton says 85–90 percent of prescription opioid users never become addicted. Layton believes it’s possible to change some addictive behaviors through doctor-patient relationships built on trust and open communication. “We call it patient-centered health care where there’s a give and take with each patient,” he says. Patient-centered health care will be a cornerstone of the curriculum at the Elson S. Floyd College of Medicine. Giving medical students “an understanding of human behavior and how to deal with it in the doctor’s office is the best way to get better outcomes in addiction cases,” he says. It is especially needed in rural communities where doctors with few resources often struggle to treat pain and addiction effectively. Layton is also pleased to see medical education moving toward more team-based health care. 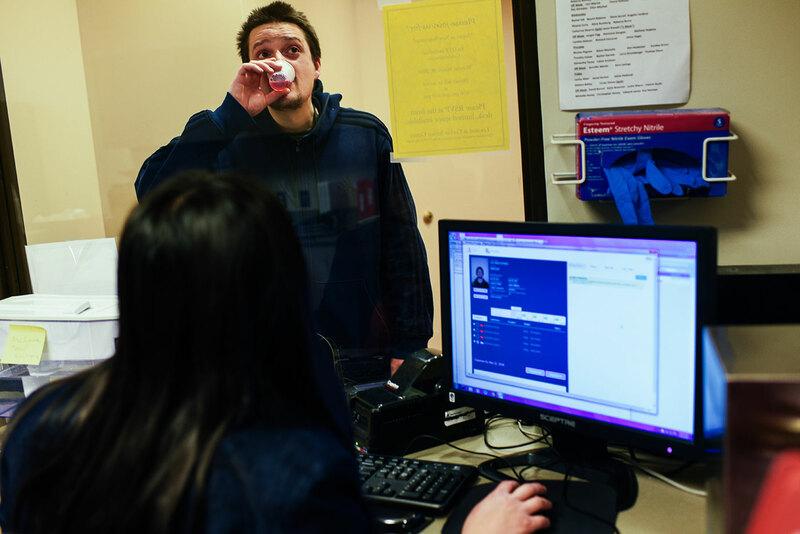 WSU students are already assisting in the methadone program through affiliation agreements with SRHD. With the August opening of the new Spokane Teaching Health Clinic at Riverpoint campus, they will be given greater opportunity. Layton says a collaborative grant between WSU and Spokane Providence Health Care will help medical residents at Spokane Teaching Health Clinic screen and identify people with addictions and refer them to SRHD for treatment. At the same time, the methadone clinic is undergoing remodeling to enhance their services. Capacity will be increased to 1,000 patients and Suboxone will be added as a treatment option. It all makes a difference to those struggling to overcome addiction and rebuild their lives, like Kris who now talks of going back to school. And Mike as he restores family relationships. To Richard, investing his life to help others in the Spokane community. And to Lakeisha, who aspires to be a writer, and one day share her story of recovery with those still waiting to take that first step. Video: Kristi Molnar-Nelson takes back her life — A veteran struggling with addiction finds hope in counseling and methadone treatments. Targeting the brain’s “bad opioids” — Neuroscience research could advance the development of new pharmacotherapy treatments for addiction. Opiates, gender, and alternative pain relief — The WSU Spokane Program of Excellence in Addictions Research (PEAR) is a wide-ranging effort aimed at improving the understanding, treatment, and prevention of addictions.